Solar energy is an alternative source of renewable energy. Conversion of solar radiation into useful heat is the simplest applications of solar energy, which can be used in water heating systems effectively. The most common used device to convert the solar radiation into heat is the flat plate collector. A lot of studies have been conducted to design and analyze the flat plate collector’s thermal behavior and operations and to improve its efficiency. In this work, computational fluid dynamics and finite element method analysis on a flat plat collector were carried out to design and fabricate the low cost solar water heater for rural areas of Oman. The developed prototype delivered100 litres of hot water with an average temperature of 50oC at 6 PM, which is considered as acceptable conditions for smaller families in Oman. Experiments were carried out at different conditions to validate the proposed design and obtained satisfactory results. The experimental results confirmed the validity of boundary conditions used for FEM and CFD analysis. The water outlet temperature of 83oC was observed in the afternoon session and this temperature would be ideal for domestic applications in Oman. Sultanate of Oman geographical location on the equator helps to develop a hot climate with 300 sunshine days per year make it an ideal location for exploring and utilization of solar energy.3–5 In Oman, some companies can provide devices for houses either for electricity and water heating. However, they don't offer it cheaply and their price not affordable to every Omanis.6–8 Hence, to utilize a significant amount of unused solar energy and also to save the environment from fossil fuel emissions, the proposed work signifies the development of cost-effective solar water heater for rural areas of Oman. Several researchers studied the performance of solar water heaters, and few are discussed in the present work. Dharmasa3 conducted a cost effective analysis of solar and wind power in Oman concentrating on Photo Voltaic (PV) and Wind Turbine (WT) systems. It was found that combined operation of solar PV and WT systems provided the optimal cost-effectiveness and feasibility. Jha6 analyzed the estimation and cost of solar PV system and its application in water pumping for a remotely located community in Oman. It was found that initial price of the PV system was higher than a diesel engine. Al-Badi & Albadi7 presented a case study on economic feasibility of installing solar water heater technologies (SWHs) in residential units of Oman. It was found that Oman weather has ideal conditions for installation of SHWs and by using SHWs Oman can save up to 1859 GWh annually. The installation cost of SHWs for the typical residential unit was around 10-year payback period and also, recommended that government should provide subsidies. Gastli & Charabi8 conducted a case study on solar water heater technologies (SWHs) for saving energy in Oman using RET Screen software. It was found that in Seeb district of Oman annual energy saving is around 335,431MWh and the study results inferred that future industrial applications do not need the construction of additional power plants. The study results highlighted that the government must provide 50% sharing of the capital costto use SWHs in their households. Chaichan2 carried out experiments on in-house developed solar desalination system for Omani families. It produced one to four liters of distilled water for a day. This experiment was part of a program done by Omani Society to raise the importance of using renewable energies in the public and private sectors. Alvarez9 presented a mathematical model of flat plate collector to study the thermal and hydrodynamic behavior of the collector. 2D and 3D-hydrodynamic and thermal simulation were carried out to determine the thermal efficiency, maximum surface temperature, overall heat loss coefficient and distribution of temperature around the collector. FEM analysis results were validated by experiment. The observed temperature rise of 18.7oC at zero tilt angles and an efficiency of 84.5% was obtained. Also, experimental results highlighted that useful energy transferred to the fluid is 45 W/m at 12:30PM and minimum energy transferred to the fluid is 1 W/m at 5.00 AM. Kazeminejad10 conducted a numerical analysis of parallel flow-flat-plate solar collector with steady-state conduction equation to observe the temperature distribution above the absorber plate. The results revealed that many parameters could affect the performance of flat plate collector, the parameters can be specified as operational, meteorological, environmental parameters; the fluid inlet temperature, tube spacing, and mass flow rate strongly affect the performance of the collector. Rama11 carried out numerical simulations to describe the performance of solar collector; study indicated that two-dimensional model is an excellent tool to optimize the design of flat plate collectors, also mention that flat plate collectors can be designed for any applications which required energy delivery up to 100oC. Experiments were carried out at different localities to validate FEM results. The study results revealed that efficiency at the beginning is increased, and decreased later due to the increase in the ratio of tube spacing to the outer diameter. Where, τ is transmission coefficient, φ is latitude angle, δ is declination and ω is hour angle. Where A is area of the collector in m2. CFD analysis is a type of fluid analysis in which specific algorithm and numerical equations are used to solve problems related to fluid flow. In this work, computational fluid dynamics analysis was used to find the pressure drop at designed collectors and also to evaluate the film heat transfer coefficient, h for the flow.19 In CFD, the governing partial differential equations for energy, momentum and mass were solved for steady incompressible flow.20 The velocity-pressure coupling had been done by using SIMPLE algorithm (Semi Implicit Method for Pressure Linked Equation) and the mean flow equations are represented in equations (7),(8) and (9). Where r density of fluid, u is velocity, µ is viscosity, E is energy, p is pressure, k is thermal conductivity and T is temperature. Conservation equations were solved in order to yield the velocity and temperature for the fluid (water) flow in the copper tubes. Where m is mass flow rate of fluid, Uo is overall heat transfer coefficient, Do is outer diameter of tube and t is thickness of tube. Energy balance equations were solved iteratively to obtain the temperature contours across the collector. The solar intensity calculation had been carried out to determine intensity of solar radiation in Oman. The study highlighted that solar intensity in the summer period is around 1000W/m2. However, experimental study indicated a maximum solar intensity of 1017 W/m2 as shown in Figure 1. In the late evening, this value is reduced to 91 W/m2. Thus, the study gave confidence in solar intensity calculations (Table 1). 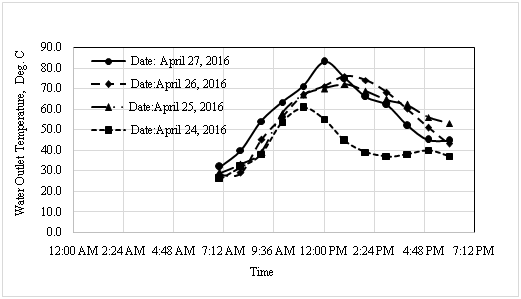 Figure 1 Solar intensity Data (Date: April 26, 2016). The straight tube and serpentine geometry were considered for the CFD analysis to find the pressure drop at designed collectors and heat transfer coefficient, h for the flow. The modeling part of fluid domain was prepared through Pro-ECAD software and imported to ANSYS-FLUENT platform. In order to predict the accurate pressure drop fine meshing approach was incorporated in the current study. The meshed details are highlighted in Table 2 and meshed geometry is presented in Figure 2. Figure 2Meshed model of CFD analysis. (A) Straight tubes. (B) Serpentine. Boundary conditions: The accurate boundary conditions plays an important role in CFD analysis. From the entry flow rate, the flow velocity of 0.004 m/s was considered for the simulation and fluid temperature of 303 K was chosen for the current study as highlighted in Table 3. CFD results: Figure 3 revealed the pressure drop variation across the straight tubes and serpentine geometries. The study results indicated that in straight tubes geometry the flow enters uniformly in all the tubes and maximum pressure drop of 0.003Pawas noticed at the outlet. The low pressure drop was due to the chosen pipe dimensions of 25.4 mm diameter and 1 m length which did not caused the reverse flow in the flow path. However, serpentine geometry with 5-passes showed pressure drop value of 0.056Pa. This could be due to the fact that, in serpentine arrangement, flow enters through the zigzag path and augments the pressure drop at the outlet. Also, the study results indicated that further increase of the passes in serpentine geometry will be contributing more pressure drop across the flow. Hence, the results clearly indicated that straight tube flow path was better than serpentine geometry. Figure 3 Contours of pressure drop – Straight tubes and Serpentine geometry. (A) Straight tubes. (B) Serpentine. Similarly, flow velocity contours for the straight tubes and serpentine geometry are presented in Figure 4. The results indicated that there is no reverse flow in the flow path and uniform flow without eddies was noticed with straight tubes geometry. The maximum flow velocity of 0.03 m/s was noticed with serpentine geometry as against a minimum value of 0.007 m/s with straight tubes. This could be due to the fact that the serpentine geometry will be contributing more pressure drop which indirectly augments the higher outlet velocity of the flow. Figure 4 Velocity contours for the Straight tubes and Serpentine geometry. (A) Straight tubes. (B) Serpentine. In addition, CFD analysis gave important information on average film heat transfer coefficient across the flow path. The calculated Nusselt number from the simulations indicated a heat transfer coefficient value of 18 W/m2K with straight tubes geometry. This value was used in FEM analysis for predicting the temperature across the tube. CFD analysis results revealed that straight tube geometry is found to be better for the proposed low cost solar water heating system. Hence, in FEM analysis straight tube geometry was used to simulate the temperature contours across the tube. The proposed collector assembly was modelled through Pro-E and imported to Ansys-Workbench. The meshed details are highlighted in Table 4 and the meshed geometry is indicated in Figure 5. Figure 5 Flat plate collector assembly- meshed model. For accurate prediction of temperature across the collector tubes, the following boundary conditions were used for FEM-thermal analysis, (Table 5). FEM results: The temperature distributions across the collector tubes is shown in Figure 6. The study results indicated 77oC - 84oC temperature variation across the collector tubes and these temperatures gave information on outlet water temperature from the solar water heater. In straight tubes geometry, all the tubes experienced uniform temperature and the maximum temperature was around 84oC at the flow exit. Thus, FEM thermal analysis coupled with CFD results indicated that five straight tubes will be sufficient to achieve the outlet water temperature of 84oC with minimum pressure drop. Figure 6 Temperature contours across the tubes. Experimental set-up: In order to validate the CFD and FEM results, experimental set-up was developed in-house to study the performance of low cost solar water heater. In the proto model development, low cost wooden box, aluminium absorption plate and copper tubes were used. 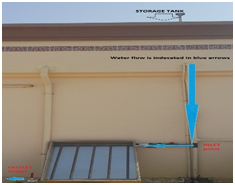 The developed low cost collector was connected to overhead water tank, which is the typical water storage arrangement in Omani houses as shown in Figure 7. In addition, the complete experiment set-up with water flow path is indicated in Figure 8. Figure 7 Pipe line path inlet to solar water heater. Figure 8 Experimental set-up of low cost solar water heater. Experimental results: To study the performance of low cost solar water heater, experiments were carried out in the month of April, 2016. Pyranometer unit was used to record the solar intensity values and two thermometers were mounted at the inlet and outlet of collector to record the water temperatures. For each day, data were collected from 7AM to 6PM to know the behavior of the water heater. The variation of water outlet temperature at different dates is highlighted in Figure 9. On April 24, 2016 the minimum water outlet temperature observed was around 61oC. This could be due to cloudy climatic conditions which led to low solar intensity values. The experimental test results indicated maximum temperature of 83.4oC on April 27, 2016 at 12:00 PM and observed solar intensity value was around 1017W/m2. The experimentally observed outlet water temperature results almost matched with the FEM simulation value of 84.6oC as indicated in Figure 6. It gave confidence to boundary conditions used for CFD and FEM simulations. Figure 9 Variation of Water outlet temperatures. In order to experience the seasonal conditions of sun orientation in Oman, experiments were carried out with different tilting angles of collector as represented in Figure 10. The water outlet temperature was recorded for tilting angles of 42o, 66o & 90o on the collector. 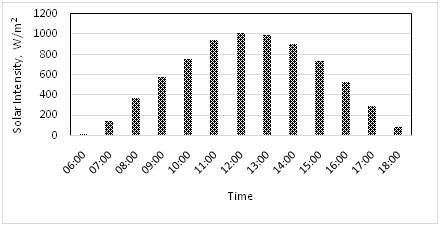 From Figure 10, it is confirmed that up to 12PM, collector tilting angle of 90o was effective due to maximum concentration of solar radiation on the collector. However in the afternoon sessions around 2PM, 66o tilting angle gave better results than the 90o orientation of the collector. This could be due to orientation of the sun and amount of sun rays dropped on the collector. Thus, this study gave information about tracking of the solar rays on collector surface which would give better performance for the water heating system. However, without a tracking system, 90o tilting angle orientation for the collector was better for water heating in Oman. Figure 10 Variation of Water outlet temperatures with different tilting angle. Flat plate collector performance: The measured experiment data were used to evaluate the energy gained by water circulating through heating system. The study showed that the collector performance is directly related to energy taken by water and absorbed solar intensity. It is observed that a collector efficiency of 50~55% for the designed low cost water heater is almost nearer to the value predicted from thermal analysis as represented in Table 6. However, on April 24, 2016, energy gained by water was less due to cloudy weather. The developed flat plate solar water heater consists of low cost wooden box, aluminium absorption plate, copper tubes and insulation sheets as shown in Table 7. Fabrication of low cost water heater was carried out in-house and its cost was compared with the price of commercial solar water heater available in Oman market. The cost comparison analysis showed that the cost of low cost water heater was at least 70% lower than commercially available solar water heater in Oman. Moreover, the developed low cost water heater delivered 100 litres of water with an average water temperature of 50oC. CFD results indicated that straight absorber tubes geometry is preferable than serpentine configuration. The experimental results highlighted a maximum water temperature of 83.4oC, which is almost in line with FEM simulated values under steady state conditions. Tilting angle of 90o is better until 12PM and for afternoon sessions 66o tilting angle showed good results due to orientation of solar radiations on the collector surface. However, in the present set-up solar tracking system was not incorporated and from low cost point of view, 90o tilting angle would be an ideal option for Oman conditions. Moreover, study results showed the collector efficiency of 50~55%, which is almost equal to efficiency obtained through thermal calculations. In addition, cost of the developed water heater is at least 70% lower than the commercially available water heater in the market. Abdul-Wahab SA, Charabi Y, Al-Maamari R, et al. CO2 greenhouse emissions in Oman over the last forty-two years: Review. Renew Sustain Energy Rev. 2015;52:1702–1712. Chaichan MT, Kazem HA, Abaas KI, et al. Homemade Solar Desalination System for Omani families. 2016b. Dharmasa D. Cost Effective Analysis of Solar and Wind Power in Oman. 2014;48(5,6). Al-Badi AH, Malik A, Gastli A. Sustainable energy usage in Oman–Opportunities and barriers. Renew Sustain Energy Rev. 2011;15(8):3780–3788. Gastli A, Charabi Y, Al-Maamari R. Potential of Solar Energy Applications in Oman’s Oil Industry. Abu Dhabi, UAE. 2011a:1–21. Jha SK. Application of Solar Photovoltaic System in Oman – Overview of Technology, Opportunities and Challenges. 2013;3(2):1–10. Al-Badi AH, Albadi MH. Domestic solar water heating system in Oman: Current status and future prospects. Renew SustainEnergy Rev. 2012;16(8):5727–5731. Gastli A, Charabi Y. Solar water heating initiative in Oman energy saving and carbon credits. Renew Sustain Energy Rev. 2011b;15(4):1851–1856. Alvarez A. PCM material and solar collector. Renewable Energies and Power Quality. 2010;6:4–15. Kazeminejad H. Numerical analysis of two dimensional parallel. International Journal of Heat & Mass transfer. 2002;8:15–30. Rama Subba Reddy. Finite element analysis of a flat plate solar collector. Finite Elements in Analysis and Design. 1997;24(4):283–290. Sanjay, Dheeraj. Fabrication and expeimental investigation of V-through flat plate collector in hot climatic condition of Rajasthan: a case study of jaipur. IJETAE. 2013;3(5):240–247. Alvarez A, Cabeza O, Varela M. Experimental and numerical investigation of a solar collector. Renewable Energy. 2010;2:15–23. Bhandari D, Singh S. Performance analysis of evacuated tube solar air collectors with and without fins. International Journal of Engineering Research & Technology. 2012;1(6):35–40. Chaichan MT, Kazem HA, Abaas KI, et al. Homemade Solar Desalination System for Omani families. IJSER. 2016a;7(5):1499–1504. Garg H P, Prakash. Solar energy - Fundamentals and applications. Tata Mc-Graw Hill Publications. New Delhi, India. 2000. John Duffie A, William Beckman A. Solar engineering of Thermal processes. USA: Wiley publication; 2013. Jorge F, Armando O. Numerical simulation of a trapezoidal cavity. Journal of Renewable energy. 2011;36(1):90–96. Rasheed Sajjadur KB. Participatory forestry as a stragety for reforestation in Bangladesh. Geo Journal. 1995;37(1):39–44. Tiwari GN. Solar energy - Fundamentals, design, modelling and applications. New Delhi: Narosa Publications; 2002. ©2018 Nayak et al. This is an open access article distributed under the terms of the Creative Commons Attribution License , which permits unrestricted use, distribution, and build upon your work non-commercially.